Spanish Talmudist and liturgical poet; born at Barcelona in 1043. He was a judge in the important community of Denia, where he became connected, probably as son-in-law, with ibn Alḥatosh. Among his later descendants was Moses b. Naḥman (Naḥmanides); Judah Albargeloni is said to have been Isaac's pupil. 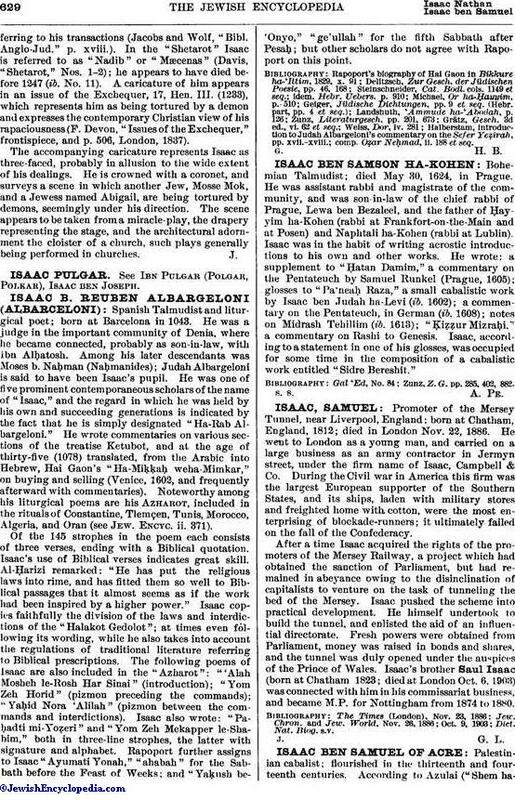 He was one of five prominent contemporaneous scholars of the name of "Isaac," and the regard in which he was held by his own and succeeding generations is indicated by the fact that he is simply designated "Ha-Rab Albargeloni." He wrote commentaries on various sections of the treatise Ketubot, and at the age of thirty-five (1078) translated, from the Arabic into Hebrew, Hai Gaon's "Ha-Miḳḳaḥ weha-Mimkar," on buying and selling (Venice, 1602, and frequently afterward with commentaries). Noteworthy among his liturgical poems are his Azharot, included in the rituals of Constantine, Tlemçen, Tunis, Morocco, Algeria, and Oran (see Jew. Encyc. ii. 371). Of the 145 strophes in the poem each consists of three verses, ending with a Biblical quotation. Isaac's use of Biblical verses indicates great skill. Al-Ḥarizi remarked: "He has put the religious laws into rime, and has fitted them so well to Biblical passages that it almost seems as if the work had been inspired by a higher power." Isaac copies faithfully the division of the laws and interdictions of the "Halakot Gedolot"; at times even following its wording, while he also takes into account the regulations of traditional literature referring to Biblical prescriptions. The following poems of Isaac are also included in the "Azharot": "'Alah Mosheh le-Rosh Har Sinai" (introduction);"Yom Zeh Horid" (pizmon preceding the commands); "Yaḥid Nora 'Alilah" (pizmon between the commands and interdictions). Isaac also wrote: "Paḥadti mi-Yoẓeri" and "Yom Zeh Mekapper le-Shabim," both in three-line strophes, the latter with signature and alphabet. Rapoport further assigns to Isaac "Ayumati Yonah," "ahabah" for the Sabbath before the Feast of Weeks; and "Yaḳush be-'Onyo," "ge'ullah" for the fifth Sabbath after Pesaḥ but other scholars do not agree with Rapoport on this point. comp. Oẓar Neḥmad, ii. 188 et seq.